The Lake District has many memorable pubs where you can find cosy log fires in winter, delightful beer gardens in summer, great food and genuine real ale. Unfortunately it has some stinkers too! If you use our guide you can be sure of getting a great day or night out, with an impartial review of the pub and its food. We'd also like to know of anywhere that you recommend, or would like to be included. This pub dates from 1762, and it's always been an important aspect of village life. Today it has a reputation for excellent food, with a contemporary restaurant environment complete with polished oak floors and handcrafted tables and chairs. The menu can be described as classic modern British, and all dishes use only the finest locally sourced produce, including both local meat and game. The great thing is that you will pay only pub prices for restaurant-quality food. No wonder booking is recommended! If you want a room for the night, there are three ensuite luxury room, with an AA four-star rating. This pub is two miles from Windermere on the road to Kendal. It has a wide choice of real ale (some of which it brews itself in the backyard), and a very extensive collection of bottled ales and whiskeys. There's a comprehensive food menu. The pub also offers accommodation. This pub is excellent. We've visited it many times over the years and it never fails to delight. Whether you're sitting outside on the terrace, or enjoying the cosy bars or the extensive dining area, you can get the best real ale and the finest food from an extensive menu of good pub food cooked with skill and flair. There's also a great range of food that we'd call gastropub in style - that is to say, more like an upmarket restaurant than a pub - from a menu that focuses on local food and produce. And the setting - well, it is truly special. The Masons Arms, Cartmel Fell, Bowland Bridge. Leave the M6 at junction 36, follow A591 (Kendal) for 3.5 miles then turn onto the A590 (heading towards Barrow-in-Furness). After approximately 2 miles turn onto A5074 and head towards Bowness and approximately 6.5 miles later follow signposts to Bowland Bridge. The Masons Arms nestles on the hillside beyond the village. A good solid Lakeland pub, offering the traditional food and high quality of beer you'd expect. The food comes from a fairly standard pub type menu, but it's dependable and well-cooked, and the pub brews its own beer, which is always a point in favour of a hostelry in my view - it means they care about what they're doing and have a passion for the product they sell. 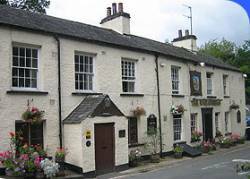 This is another popular (and deservedly so) pub in Coniston, near the centre of the village and on what was originally a pack horse trail. Both the Sun Inn and the Black Bull are over 400 years old, so they both have lots of atmosphere, with flagged floors, oak beams, roaring fires and so on. The Sun Inn is a Free House, and serves a wide range of guest ales and an excellent range of food which is perhaps slightly more ambitious than the food at the Black Bull. This is one of the most traditional and characterful pubs in the area, with rooms to let which maintain a real sense of the pub's history. It's a place full of oak beams and uneven floors, creaking timbers and low windows. But the facilities have been modernised and offer a comfortable place to stay. The pub has a snug little bar and a good selection of beers, a simpler lunch menu and a more ambitious menu during the evening. The King's Arms, Market Square, Hawkshead. A good menu, featuring Herdwick lamb, venison, lake trout from Esthwaite Water, fish and so on. The bar's just as historic as the King's Arms, and offers a warm welcome, whether you plan on staying, you're just popping in for a pint and a sandwich, or you want to enjoy the full dinner, which has aspirations towards something more complex than your average pub menu. It's hailed - and rightly so - as one of the UK's leading gastropubs, but it still serves as a local pub with fine ale. Although it can be busy, if you choose your time just right, you can still enjoy a quite pint on the terrace overlooking an exquisite view of the fells. The food is unmissable, the service is well-executed, the ale is brewed on the premises, and to cap it off, there's 60 acres of private land attached to the pub. The Drunken Duck, Barngates, 3 miles from Ambleside, watch for the sign off the B5286 to Hawkshead. This is the town's oldest pub, behind St. Martins Church, and it's named after the hole in the wall through which beer was passed to the blacksmith's workshop. The stone flagged floors, bar meals, fine food and real ales are highly enjoyable, as is the beer garden outside on summer evenings. Most rate it as the best traditional pub in Bowness, with a lively atmosphere and fresh local food. Live music every Friday evening throughout the Summer. The Hole in t' Wall, Lowside, Robinson Place, Bowness-on-Windermere. This charming inn is family run and has a very welcoming atmosphere. It's located in the heart of Bowness, a minute or two from the Bowness bay piers and the lake itself. There are many exciting craft and gift shops only a few minutes' walk away. You can stay overnight or longer here, in the very homely and comfortable rooms, or you can enjoy a drink and a meal - the menu is renowned for its quality and value. This is certainly one of our favourite pubs in Bowness, and well worth a visit. It's hard to fault the amazing setting of this historic little pub and hotel at the head of the Langdale valley. (And it has rooms - excellent if you want a base in the Langdales). It's hosted some of the world's finest climbers in its time - and continues to serve as a base for walkers and mountaineers - even though it's been brought more up to date with en-suite showers in the bedrooms (well, some of them, at least!). It's also lost its image as the kind of place where climbers once threw their glasses into the fireplace at the end of a hard day's walking.....and it does serve great food and fine ales. If you want the more refined atmosphere of the restaurant, you'll need to book, but the bar serves good tasty and simple pub food. The New Dungeon Ghyll Hotel has a nice bar with a terrace, good pub food and some comfortable and more luxurious rooms (compared to the Old DG) for those wanting accommodation in the valley. They also have a very good restaurant. And some of my nicest pints of beer have been drunk here, sitting on the terrace after a hard day walking on the mountains just behind the hotel. The bar food is recommended. Highly recommended. A favourite pub for many walkers and passers-by, this pub is marked out by its traditional atmosphere and the fine ales it serves. As one person said: "What a marvelous pub the Golden Rule is. I went in there a month ago late on after a hard day in the fells. The staff, the locals and indeed the beer were all tremendous. 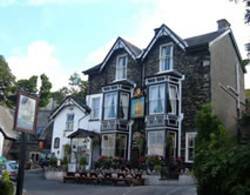 This is a pub that's absolutely head and shoulders above the rest in Ambleside. The landlord must be one of the nicest people I've ever met." Smithy Brow, Kirkstone Road, Ambleside (follow signs towards Grasmere and turn right at mini-roundabout just before St Martin's College). Wonderful traditional inn with massive slate fire nook, original oak beams, carved oak bar and two log fires. Excellent bar food and a very good restaurant with such items as seared tuna, stuffed pheasant and steak and ale cobbler. Rooms to let. Troutbeck, 3 miles from Windermere on A592. A very traditional pub, with rooms to let. Lots of atmosphere, a good choice of ales, bar meals, snacks and sandwiches, a traditional tap-room with open fires, and a wonderful garden with fantastic views looking straight down the Troutbeck valley towards Windermere. Troutbeck, 3 miles from Windermere on A592, turn sharp left just beyond Queen's Head. This pub is part of the Langdale Estate, which owns much of Elterwater Village, the Langdale Hotel and Country Club, and large parts of Chapel Stile. I haven't been in this pub myself, but all the people I know who have tried it speak very highly of it, so we've included it here. I'm told it serves great bar meals, and it certainly has an attractive setting. This pub is just outside the village, and it is a very attractive, traditional place full of oak, beams, fireplaces with real fires, and little nooks and crannies. Unfortunately it's also situated on the main road from Ambleside to Keswick. But still, it's a delightful place to have a pint, while (to quote their website) the bar restaurant, popular with locals and tourists alike, presents an extensive menu of award winning food featuring local and provincial dishes. From personal experience I can vouch for the fact that they do indeed have many local real ales, an extensive cellar of fine wines, and a wide range of malt whiskies! This pub is worthy of your attention because it's the highest in the Lake District, though not in England. The view, as you might therefore expect, is absolutely superb, and you can sit outside with a beer and watch the sun go down over the magnificent view. There are rooms if you want to stay; the food is basic pub grub with roasts on Sunday, with daily specials, but it's all well-prepared. If you're travelling over Kirkstone Pass in winter, this is an especially welcoming place to break your journey. It's well worth walking the short distance up the hillside from the village centre to this pub, where you can enjoy good beer and unpretentious food. Patterdale's only pub is the White Lion. It comes highly recommended for its draught ales and sizzling steak platters. As an alternative, you could try the trout with almonds, which is equally delicious. The pub's right in the centre of the village. A pub by the main railway station which has a devoted following. The Cumbrian lamb is especially good. Certainly I've always enjoyed good food here over a period of many years (the lamb, especially!). Wasdale is one of the most remote and delightful spots in England, and yet it has this wonderful hotel-come-pub, with some charming rooms to let and a restaurant that serves a delightful four-course (and pretty sophisticated) dinner at a very reasonable price. We've stayed here several years on the trot and had some fine old times - though maybe not so much with the weather, since this is one of the wettest places in England - and I highly recommend the accommodation. If you're staying in the hotel, the breakfasts are absolutely delicious. You occasionally have to put up with the staff dropping everything and running off on a rescue mission with the local mountain rescue team, but it is a charming, idiosyncratic, and delightful place. You won't have any trouble finding it. The road down Wasdale ends at the hotel. Ennerdale is the most remote of the Lakes, with no road, and it's pretty inaccessible (which may be a point in its favour for many people!). The Shepherd's Arms comes highly recommended (especially by those who have walked the coast to coast path, on the route of which it lies) for its hearty bar meals and good choice of beers. It also has comfortable rooms to let. A beautiful old inn which has had a contemporary make-over, providing sumptuous accommodation in a building of great character. Excellent food and accommodation. Although more of a hotel than a pub, you can get top-notch bar food, and they serve a fine collection of real ales, together with hot drinks and refreshments in the bar. They also offer a very impressive dinner in the excellent restaurant. Accommodation is available. A more informal option than the Bridge Hotel. Again, it can't be faulted on its range of bar meals, beer and accommodation. A good pub, with an ancient atmosphere (including oak beams and open fires), supplying tasty bar food and with the advantage of an outside beer garden. The pub has a very pleasant ambience and will provide you with all the facilities you need to refresh yourself if you're doing any of the fells round here. Because of the quality of the bar meals, this pub is often very busy. It has a strong local following - always a good sign! Jennings beer is served, and seems to be of consistently good quality. It's a friendly and well kept hostelry. A popular local pub with live music and a standard pub grub menu. It also has a slightly more ambitious restaurant menu. Nice to see a traditional pub! Very popular with locals and tourists alike. One of Keswick's classic pubs, with slate floor, old beams, and a changing selection of guest ales. An unpretentious pub which is deservedly popular with everyone on account of its beer, food and atmosphere. They offer very reasonably priced bar food all day. There's a lovely warming log fire at one end with a bare slate floor. Plenty of tables and chairs scattered around and good quality photos of mountains on the walls. The new owners have put some effort into the pub and especially into the tasty, fresh cooked food and the Jennings' ales. Reliable food and beer - and good value. Lake District walks for all abilities here!